Why should the Oxted line, amongst so many in the southern counties, deserve a history? After all, it is nowadays just another suburban electric railway whose trains look the same as those anywhere else in the south. But it was not always so. Long after all the other lines into London had been electrified steam traction was retained and the line definitely had the status of a secondary main line. Even when diesel trains took over the sense of being ‘different’ and somewhat special did not entirely disappear. 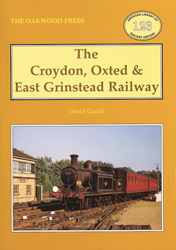 The origins of the line lay in two companies, the Surrey & Sussex Junction and the Croydon, Oxted & East Kgrinstead, both having unusual features: no engine ever turned a wheel for the Surrey & Sussex Junction; and the Croydon, Oxted & East Grinstead was a joint committee of two other railway companies. But, more than that, it was a railway in the round, for no narrow straits confined its traffics. It took away lime from Oxted and bricks from Lingfield, and brought in coal for ample firesides. Racehorses and bananas both received special treatment. Bookmakers mingled with well-connected families going to their country seats. Even today it is more than merely a commuters’ line, for there is an appreciable leisure traffic (mainly shopper) and journeys are still made between some ofl the intermediate stations. So here then is the full story of the Oxted line ans its fascinating services, from construction to the present day. A5 format, 208 pages, 140 photographs / maps / plans etc.